Not to be confused with COSCO, Cosco (India) Limited, Cusco, or CUSCO Japan. Costco's original logo. Used until 1993, but stores continued to carry the logo until 1997. Costco Wholesale Corporation, doing business as Costco, is an American multinational corporation which operates a chain of membership-only warehouse clubs. As of 2015, Costco was the second largest retailer in the world after Walmart, and as of 2016[update], Costco was the world's largest retailer of choice and prime beef, organic foods, rotisserie chicken, and wine. Costco is ranked #15 on the Fortune 500 rankings of the largest United States corporations by total revenue. The company is also planning to open a warehouse in China in 2019. Costco's worldwide headquarters are in Issaquah, Washington, a suburb east of Seattle; the company opened its first warehouse in Seattle 36 years ago in 1983. Through mergers, Costco's corporate history dates back to 1976, when its former competitor Price Club was founded in San Diego, California. As of March 7, 2019[update], Costco had a total of 770 warehouses: 531 in the United States and 4 in Puerto Rico, 100 in Canada, 39 in Mexico, 28 in the United Kingdom, 26 in Japan, 15 in South Korea, 13 in Taiwan, 10 in Australia, 2 in Spain, and 1 in Iceland and France. Costco's history began with Sol Price and his son, Robert, opening the first Price Club warehouse on July 12, 1976, on Morena Boulevard in San Diego, California, thus giving birth to a new concept: a retail warehouse club. The Price family placed Price Club Warehouse #1 inside a series of old airplane hangars previously owned by Howard Hughes; that warehouse, now known as Costco Warehouse #401, is still in operation today. Costco opened its first warehouse in 1983 in Seattle on September 15, by James (Jim) Sinegal and Jeffrey H. Brotman. Sinegal had started in wholesale distribution by working for Sol Price at FedMart and Brotman, an attorney from an old Seattle retailing family, had also been involved in retail distribution from an early age. He began his retail involvement as a grocery bagger. A second store opened in Portland in October, and a third in Spokane in December 1983. In 1993, Costco and Price Club agreed to merge operations themselves after Price declined an offer from Sam Walton and Walmart to merge Price Club with their warehouse store chain, Sam's Club. Costco's business model and size were similar to those of Price Club, which made the merger more natural for both companies. The combined company took the name PriceCostco, and memberships became universal, meaning that a Price Club member could use their membership to shop at Costco and vice versa. PriceCostco boasted 206 locations generating $16 billion in annual sales. PriceCostco was initially led by executives from both companies, but then the Price brothers soon left the company in 1994 to form Price Enterprises, a warehouse club chain in Central America and the Caribbean unrelated to the current Costco. In 1997, the company changed its name to Costco Wholesale Corporation and all remaining Price Club locations were rebranded as Costco. On April 26, 2012, CNBC premiered its documentary, The Costco Craze: Inside the Warehouse Giant. In 2014, Costco was the third largest retailer in the United States. That year Costco announced plans to open an online store in China using Alibaba Group. In the United States, Costco's main competitors operating membership warehouses are Sam's Club and BJ's Wholesale Club. Costco employs more than 205,000 full and part-time employees worldwide. In 2016, Costco had 85 million members. In 2017, Costco had 90.3 million members. Costco was the first company to grow from zero to $3 billion in sales in under six years. For the fiscal year ending on August 31, 2012, the company's sales totaled $97.062 billion, with $1.709 billion net profit. Costco is 18th on the 2015 Fortune 500. The ACSI (The American Customer Satisfaction Index) named Costco number one in the specialty retail store industry with a score of 84 in 2014. From December 2013, Costco's board of directors was chaired by co-founder Jeffrey H. Brotman and included James Sinegal, co-founder and director, and two officers of the company: president/CEO W. Craig Jelinek and CFO Richard A. Galanti. On August 1, 2017, Jeffrey Brotman died. As of August 2017[update], James Sinegal and W. Craig Jelinek remain on the board. For the fiscal year 2018, Costco reported earnings of US$3.134 billion, with an annual revenue of US$141.576 billion, an increase of 9.7% over the previous fiscal cycle. Costco's shares traded at over $205 per share, and its market capitalization was valued at over US$95.7 billion in October 2018. Costco focuses on selling products at low prices, often at very high volume. These goods are usually bulk-packaged and marketed primarily to large families and businesses. Furthermore, Costco does not carry multiple brands or varieties where the item is essentially the same except when it has a house brand to sell, generally under the Kirkland Signature label. This results in a high volume of sales for the brand in question, allowing further reductions in price and marketing costs. A typical Costco warehouse carries only 4,000 distinct products, while a typical Walmart Supercenter carries approximately 140,000 products. If Costco feels the wholesale price of a product is too high, they will refuse to stock the product. For example, in November 2009, Costco announced that it would stop selling Coca-Cola products because the soft-drink maker refused to lower its wholesale prices. Costco resumed selling Coca-Cola products the following month. Costco also saves money by not stocking extra bags or packing materials; to carry out their goods, customers must use a shopping cart, bring their own bags, or use empty merchandise shipping boxes from the company's vendors. Lighting costs are reduced on sunny days, as most Costco locations have several skylights. During the day, electronic light meters measure how much light is coming in the skylights and turn off an appropriate percentage of the interior lights. During an average sunny day, it is normal for the center section of the warehouse not to have interior lights in use. Most products are delivered to the warehouse on shipping pallets and these pallets are used to display products for sale on the warehouse floor. This contrasts with retail stores that break down pallets and stock individual products on shelves. 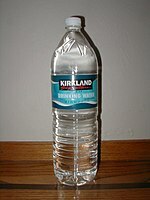 Most products sold at Costco have an 8% to 10% markup, while Kirkland Signature brand products have a 15% markup. The company runs very lean, with overhead costs at about 10% of revenue and profit margins at 2%. It has no public relations department and does not buy outside advertising. Costco's annual membership fees account for 80 percent of Costco's gross margin and 70 percent of its operating income. Costco has a frequently changing inventory and is known for carrying products for a time, then discontinuing them or using them as seasonal products. Over the years, Costco has gradually expanded its range of products and services. Initially, it preferred to sell only boxed products that could be dispensed by simply tearing the stretch wrap off a pallet. It now sells many other products that are more difficult to handle, such as art, books, caskets, clothing, computer software, fine wine, furniture, home appliances, home electronics, hot tubs, jewelry, perishable items (such as dairy, fresh baked goods, flowers, fresh produce, meat, seafood), solar panels, tires, and vacuum cleaners. Many warehouses also have gas stations, pharmacies, hearing aid centers, optometrists, eye and sunglass centers, photo processors, and tire garages. The produce items that require refrigeration are kept in a walk-in refrigerator, and several locations even have a walk-in refrigerator for dairy items. Some locations have liquor stores, often kept separate from the main warehouse in order to comply with liquor license restrictions. In some states (such as Texas), the liquor store must be owned and operated by a separate company with separate employees. In 2006, Costco lost a lawsuit against the state of Washington in which it was seeking to purchase wine directly from the producer, bypassing the state retail monopoly. In Australia, Costco has to comply with regulations set by each state they choose to trade in; their first store in the state of Victoria benefits from some of the most liberal alcohol licensing laws in the country, with retailers permitted to sell alcohol on shelves within the store, in a manner similar to most European countries. In the Canadian province of Quebec, beer and wine are sold within the stores from pallets. "Kirkland Signature" is Costco's private label. It is sold by Costco at their website and warehouses, and is trademarked by the company. Costco introduced Kirkland Signature as its private label in 1992, deriving the name from the location of Costco's then corporate headquarters, Kirkland, Washington (their HQ later moved, roughly 12 miles (19 km), to Issaquah, Washington). It accounts for almost a third of all Costco sales and is growing faster than Costco sales. The idea for the private label was to provide brand name quality products at discounted prices. To counteract the consumer confidence problem common in store-name branding, Kirkland Signature occasionally employs co-branding. According to Costco, while consumers may be wary of same-store branding, they are less likely to be wary of brands that they are familiar with and trust. The Costco Connection is a magazine sent free to members of Costco; it can also be accessed online by anyone, free of charge. The magazine, established in 1987, features articles which regularly tie into the corporation along with business, celebrity features, cooking, entertaining, health, home improvement, and social articles, as well as coupons and ads. MediaPost reports: "While about 90% of the magazine's advertising is co-op, increasingly national advertisers such as Procter & Gamble are buying space, notes Roeglin -- presumably because of the pub's gargantuan reach and the data it has on its subscribers (whose average household income is $156,000 a year). 'We see about 56% of our subscribers a month buy something at one of our stores based on something they've read in the magazine,' says Roeglin." The magazine is the largest-circulation print monthly in the United States. Costco also publishes the Costco Household Almanac and a cookbook series. Costco offers a free "concierge" service to members who purchase electronics, to help answer questions regarding setup and use and avoid potential returns due to not understanding how to use the products. Costco acts as an investment broker and travel agent. Costco has an agreement with Ameriprise for auto and home insurance. In 2004 Costco offered an original artwork by artist Pablo Picasso on their online store; more recently[when?] a highly regarded 1982 Mouton Rothschild wine was offered as well as other rare wines in rotation. Costco Photo Center is a multi-functional photography printing lab offering services at the warehouses as well as through their web site, costcophotocenter.com. The website provides free unlimited digital file storage with a current membership. Previous to May or June 2010, Costco had an agreement with Mypublisher.com for custom book and calendar publishing. Now,[when?] they print the photobooks and calendars themselves. On March 9, 2005, NOVA Information Systems (NOVA) partnered with Costco to market and support payment processing services to Costco Canada's Business Executive Members. Costco Optical ranks as the fifth-largest optical company in the US, as of 2015[update]. Optometrists working at Costco locations will see patients without Costco memberships, although a membership is required to fill a prescription at the optical department. Costco Travel is a wholly owned subsidiary of Costco Wholesale and offers leisure travel to Costco members of the United States and Canada. The program was established in 2000 as a service to Costco members. Costco Travel's offices are located in Issaquah, Washington, adjacent to Costco's corporate headquarters. Costco Travel employs over 700 travel professionals, all of them Costco employees. The program offers vacation packages to the Caribbean, Europe, Florida, Hawaii, Las Vegas, Mexico, and the South Pacific. Other products include car rentals, cruises, guided vacations, and theme park packages. Select products feature additional benefits for Costco Executive Members. The program is marketed directly to Costco members through various Costco avenues, including the Travel Guide to Savings (found in all U.S. Costco warehouses) and in the Travel section of Costco.com. Most (if not all) Costco locations have a food court. They can be indoors or outdoors, but the menu is essentially the same: hot dog with drink (one of the food court's most popular items), pizza, frozen yogurt, various drinks, baked items, and sandwiches. Sometimes, items are added to the menu seasonally. Costco offers a quarter-pound 100% beef hot dog and 20 US fluid ounces (590 ml) drink (with refills) for US$1.50, the same price since 1985. In Australia, the hot dog is made of pork and is sold with a large soda for AUD$1.99. In Canada, the price for a hot dog and soda with refills is C$1.50. In Mexico, the hot dog is made of 100% beef and includes a drink (with refills) for MXN$35. In the UK, the hot dog is also made from beef and customers also get a drink (with refills) for £1.50. Costco sold more than 137 million quarter-pound (113 g) hot dogs in its food courts in 2017. Cheese, pepperoni, veggie, or combo pizza is also available in most locations, and can usually be ordered to go, making Costco arguably the 14th largest pizza chain in the US in 2010. Frozen yogurt is also served in chocolate, vanilla, or swirl. 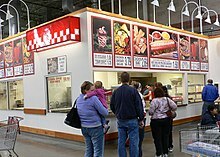 Costco also offers fruit smoothies, latte freeze (without chocolate), mocha freeze (with chocolate), beef bake, chicken bake, turkey provolone sandwiches, twisted churros, chicken Caesar salads, beef brisket sandwiches, organic beef-based cheeseburgers, beef chili with beans, and in some locations, gelato. Various locations also began offering acai bowls in 2018. French fries are also offered in some locations. Some of the food court items are only available in certain countries. For example, the bulgogi bake is only available in Taiwan, Korea, and Japan; poutine is only available in Canada; and plokkari only in Iceland. There are, however, temporary menu items available exclusively in several countries, like the pizza al pastor in Mexico. The nutrition data for the Costco Food Court items is posted online. Due to slow sales, in 2009 the pretzel was replaced by the churro. In April 2013, Pepsi replaced all Coca-Cola fountain drinks at US locations because Coke had raised its prices; this helped keep the hot dog combo with soda at its original US$1.50 price. In select Costco food courts, Costco is selling cheeseburgers for a limited time to experiment sales. It will possibly be a new menu item if it has a success. In December 2005, Costco signed an agreement with PhotoChannel Networks Inc., whereby Costco could deploy the PNI Digital Media Platform to offer online photo printing for Costco members through the website. On July 17, 2015, Costco disabled their online photo site. In common with other retailers, there is currently no confirmation about whether hackers had stolen Costco customers' photographs or data. As of August 1, 2015[update], Costco was estimating the website might return in mid August, after a four-week outage. On April 17, 2001, Costco Wholesale opened a B2B (Business to Business) online shopping site at Costco.com for faster and easier business shopping. The domain Costco.com attracted at least 58 million visitors in 2008, according to a Compete.com survey. Costco.com is for United States members; costco.ca is for Canadian members, and other countries, such as Mexico, South Korea, Taiwan and the UK, each has its own online Costco shopping website. Instacart offers Costco delivery in a select number of states including Arizona, California, Colorado, Florida, Georgia, Illinois, Indiana, Massachusetts, Maryland, Minnesota, Missouri, North Carolina, New Jersey, New York, Oregon, Tennessee, Texas, Virginia, Washington, and the District of Columbia. No membership is needed to order from Costco on Instacart, but Instacart charges delivery fees and the prices may not necessarily be the same as in a Costco warehouse. Similarly, in March 2017, Costco initiated a partnership with Shipt, an online grocery delivery service. Unlike Instacart, Shipt charges its own membership fee, $99 a year or $14 a month, in exchange for free delivery on orders over $35. As of November 2018[update], Shipt offers Costco delivery in select Florida markets. In October 2017, Costco launched same-day and two-day grocery delivery options for members. While some former Price Club locations in California and the northeastern United States are staffed by Teamsters, the majority of Costco locations are not unionized although there seemed to be a move in 2012 to unionize some locations in Canada. The non-union locations have revisions to their Costco Employee Agreement every three years concurrent with union contract ratifications in locations with collective bargaining agreements. The Employee Agreement sets forth such things as benefits, compensations, wages, disciplinary procedures, paid holidays, bonuses, and seniority. The Employee Agreement is subject to change by Costco at any time and offers no absolute protection to the workers. As of March 2011[update], non-supervisory hourly wages ranged from $11.00 to $21.00 in the U.S., $11.00 to $22.15 in Canada, and £8.50 to £11.50 in the United Kingdom. In the U.S. as of 2005[update], eighty-five percent of Costco's workers had health insurance, compared with less than fifty percent at Walmart and Target. Health benefits include coverage through Aetna, remote primary care through Teladoc, second opinions and clinical navigation by Grand Rounds, and wellness coaching by Omada. Product-demonstration (e.g., food samples) employees work for an outside company. In the western U.S., the company is called Warehouse Demo Services, Kirkland, Washington. Costco also uses Club Demonstration Services, based in San Diego, California. In Canada, demonstrations are done exclusively by Professional Warehouse Demonstrations. Demonstration employees receive a pay and benefit package that is less than that of Costco employees. As of August 1, 2017[update], demonstrations/samples are provided by CDS in Canada. In 2014, The Guardian reported that Costco is a client of Charoen Pokphand Foods. Over six months, The Guardian traced down a supply chain from slave ships in Asian waters to leading producers and retailers. Costco has published a statement saying it has had a supplier code of conduct since 1999 which does not allow this practice, and that independent auditors check for violations regularly. Aerial perspective of the Costco roof at Melbourne's Docklands store. March 2019. Warehouses outside the US are similar to those in the US. Layout, signage, and even parking lot markings are generally identical to warehouses in the US. Food court menus are tailored to international tastes, with meat pies on offer in Australia, poutine in Canada, seafood-topped pizza in Asian and Mexican locations, clam chowder in Japan, South Korea, and Taiwan, and plokkfiskur in Iceland and jacket potatoes in the UK. Additionally, Costco has led a strategic initiative within the past year to enhance their merchandise mix available within international warehouses to tailor products to local tastes, with a mix of both American and local products available. Costco announced it opened 29 new locations in 2016, the most in one year since 2007. In 2005, the world's largest Costco was located in Hillsboro, Oregon. In 2015, Costco completed an expansion in Salt Lake City, making it the new largest Costco at 235,000 sq ft (21,800 m2). In 2011, Costco's highest volume store was in Seoul, South Korea. Costco Business Centers are warehouses similar to regular Costco warehouses, and are open to all Costco members, regardless of membership type. Their merchandise, though, cater predominantly to enterprises, with a focus on small businesses. Business Centers do not carry most consumer items like clothing, jewelry, media, and tires, while carrying larger quantities and more options for the business products they do carry. They do not offer most of the consumer-oriented services found at regular Costco warehouses, but some locations do have a food court or a gas station or both. Also unlike regular warehouses, most Costco Business Centers have a Print & Copy Center which provides printing professional services. They have large parking spaces for trucks and are capable of delivering goods to businesses in bulk quantities. Finally, opening hours are shorter than regular warehouses (usually opening at 7 am on Mondays to Saturdays and closed on Sundays), while discounts and coupons for Business Centers are issued separately from regular warehouses. As of August 2017[update], there are 17 Costco Business Centers in the United States, located in Orlando, Florida; Phoenix, Arizona; California (Commerce, Hawthorne, Hayward, North Hollywood, San Diego, South San Francisco and Westminster); Denver, Colorado; Morrow, Georgia; Bedford Park, Illinois; Hackensack, New Jersey; Las Vegas, Nevada; and Washington (Lynnwood, and Fife). The first Costco Business Center outside the US opened in Canada in Scarborough, Toronto in spring 2017. Like many other retailers vertically integrating their food supply chains, Costco has brought in-house poultry production for their rotisserie chickens, which are a major driver of customer traffic and sales. This is to allow keeping their pricing intact while maintaining a consistent quality control of its chickens as a result of annual growth of per-capita chicken consumption in the United States. The first Costco Home warehouse opened in 1983 and was rebuilt / expanded in 2002 in Seattle. The warehouse's concept was to combine the value, setting and members-only elements of Costco's warehouse clubs with the product array one would find at an upscale home store, such as Fortunoff or Crate & Barrel. The Costco Home warehouses sold furniture, housewares, kitchen products and accessories from higher-end brands such as Lexington, Ralph Lauren and Waterford in a warehouse-club setting. Costco claimed that, similar to its main warehouses, it accepted lower margins in return for greater volume with minimal overhead. Over time, the concept was adjusted to include home electronics, some major appliances, office furniture, and a large selection of outdoor furniture and window treatments. Costco also partners with Glentel subsidiary WIRELESS etc. to sell mobile phones and plans in Canada and Wireless Advocates in the US. In 2010, Mercy for Animals conducted an undercover investigation at Buckeye Veal Farm, a veal supplier to Costco. Immediately following the investigative release, Costco adopted a policy against purchasing veal from producers that use the crate-and-chain production method. The case prompted Ohio lawmakers to vote in favor of a veal crate phase-out in the state. In 2012, Mercy for Animals conducted an undercover investigation at a pork supplier to Costco, Walmart, Safeway, Kroger, and Kmart. Before the public release of the investigation, Costco announced they would begin requiring their pork suppliers to phase out gestation crates. In 2015, The Humane Society of the United States conducted an undercover investigation at an egg supplier to Costco. An undercover worker at Hillandale Farms, a major egg supplier to Costco, filmed conditions in which egg-laying hens lived in tiny, wire cages. Following the investigations, several celebrities including Brad Pitt and Ryan Gosling publicly wrote to Costco to address this issue. Following efforts by animal protection nonprofits including The Humane League, Costco released an updated commitment to source exclusively cage-free eggs in its operations. In 2016, a follow up to Costco's shift to cage-free eggs by animal rights group Direct Action Everywhere (DxE) reported cannibalism and high mortality at a cage-free Costco egg supplier. Costco denied the allegations, but the video sparked a discussion about animal welfare problems continuing to exist at cage-free egg farms. Writing in The Huffington Post, DxE co-founder Wayne Hsiung argued that the new investigation, rather than suggesting that Costco should keep birds in cages, indicated that hens should have the right not to be raised for food or kept on farms at all. In August 2017, a federal judge ordered a "deceptive" Costco to pay Tiffany & Co. $19.4 million for misleading consumers into thinking they could buy legitimate Tiffany merchandise at warehouse club prices. ^ "Second Quarter Results". March 7, 2019. Retrieved March 10, 2019. ^ a b c d e f "Costco Annual Report". October 18, 2018. Retrieved November 11, 2018. ^ "Costco Wholesale Corporation Company Profile". Hoover's. Retrieved 17 April 2019. ^ a b c d Gabler, Neal (December 15, 2016). "The Magic in the Warehouse". Fortune. pp. 184–189. ^ a b Bartel, Frank (December 18, 1983). "Costco: The new 'wholesale' club". Spokesman-Review. (Spokane, Washington). p. B1. ^ "Death of Costco co-founder Jeff Brotman, 74, 'a complete shock'". The Seattle Times. 2017-08-01. Retrieved 2017-11-29. ^ a b c d e f "Why Become a Member". Costco Wholesale. Retrieved May 17, 2015. ^ a b c d e "Costco Wholesale Historical Highlights" (PDF). Costco Wholesale. February 12, 2009. Retrieved November 27, 2009. ^ a b c "Costco Corporate Profile". Costco Wholesale. Retrieved March 10, 2019. ^ a b Jung, Angela (August 23, 2018). "'There's excitement in the air': Costco's 100th Canadian store opens in Leduc County". CTV Edmonton. Edmonton, Alberta. Retrieved August 23, 2018. ^ "Morena Warehouse". Costco Wholesale. Retrieved July 9, 2018. ^ Chesley, Frank (June 6, 2007). "Biography of Jeffrey Brotman". Historylink.org. Retrieved February 20, 2012. ^ "Costco CEO's legacy continues as he steps down". Reuters. September 1, 2011. Retrieved 2018-02-05. ^ Sol Price; John Helyar; Ann Harrington (November 24, 2003). "Sol Price On Off-Price". Fortune. ^ "Costco, Form SC 13E4, Filing Date Nov 21, 1994". secdatabase.com. Retrieved March 29, 2013. ^ "PriceCostco Company History". FundingUniverse. ^ "The Costco Craze: Inside the Warehouse Giant". New York, NY: CNBC. April 11, 2011. Retrieved April 17, 2012. ^ "Top 100 Retailers (2014)". National Retail Federation. ^ "Costco to enter China through Alibaba's Tmall" (Press release). Reuters. October 14, 2014. ^ "BJ's Smaller in Store Size but Mightier in SKU Count". Home Textiles Today. Reed Elsevier. July 20, 2009. Archived from the original on November 1, 2009. Retrieved October 28, 2009. ^ a b "Costco, Form 10-K, Annual Report, Filing Date Oct 19, 2012" (PDF). secdatabase.com. Retrieved March 28, 2013. ^ Costco Wholesale Today. June/July 2016 issue. ^ "Costco Wholesale". Fortune. June 2, 2015. Retrieved June 2, 2015. ^ "Benchmarks by Company". American Customer Satisfaction Index (ACSI). Retrieved May 17, 2015. ^ Horowitz, Julia. "Costco's co-founder and chairman dies". ^ "Annual Report 2016" (PDF). ^ a b "2017 Annual Report" (PDF). ^ Transcripts, SA (2018-10-05). "Costco Wholesale Corporation (COST) Q4 2018 Results - Earnings Call Transcript". Seeking Alpha. Retrieved 2018-11-18. ^ Fredrix, Emily (November 16, 2009). "Costco nixes Coke products over pricing dispute". The Street. Associated Press. Retrieved November 27, 2009. ^ Joe Guy Collier (December 10, 2009). "Coke returns to Costco next week". The Atlanta Journal-Constitution. Archived from the original on December 16, 2009. Retrieved December 24, 2009. ^ Melissa Allison (December 10, 2009). "Costco brings back Coke next week, reports 1 percent boost in first-quarter profit". The Seattle Times. Retrieved December 24, 2009. ^ "A Cart Full of Energy Savings" (PDF). PGE.com. Retrieved February 20, 2012. ^ Bary, Andrew (March 23, 2009). "Kings of the Jungle". Barron's. Dow Jones & Company. Archived from the original on April 7, 2009. Retrieved April 7, 2009. ^ Santoso, Alex (September 9, 2013). "10 Fascinating Facts About Costco". Retrieved June 28, 2016. ^ 'Costcoholics': Costco's $113.7 Billion Addicts Forbes, Retrieved April 18, 2017. ^ "Business Spotlight: Costco Wholesale". Archived from the original on December 26, 2008. Retrieved October 26, 2006. ^ Green, Dennis (11 January 2019). "Shoppers love Costco's Kirkland Signature brand, and it's turned into the retailer's biggest asset". Business Insider. Retrieved 25 February 2019. ^ Broberg, Brad (April 1, 2007). "Costco buying power makes dent in private-label wine market". Retrieved March 30, 2007. ^ Duff, Mike (December 19, 2005). "A private label success story". DSN Retailing Today. Archived from the original on February 21, 2007. Retrieved November 27, 2009. ^ "Online Edition". The Costco Connection. Retrieved November 8, 2012. ^ Said, Sammy (July 1, 2013). "The Top Ten Best Selling Magazines in the United States". The Richest. Retrieved August 4, 2015. ^ a b Robins, J. Max (March 6, 2015). "Costco's Surprisingly Large-Circulation Magazine". MediaPost. ^ "The Costco Connection Online Edition". Costco. ^ "Costco Wholesale Return Policy". Costco. Archived from the original on February 19, 2012. Retrieved February 20, 2012. ^ a b "Costco Auto & Polaris Team Up for Special Offer". Addicted to Costo. September 22, 2015. ^ a b "Costco Auto Teams with GM for Holiday Sales Event". Addicted to Costco. October 13, 2015. ^ "NOVA Partners with Costco Wholesale Canada to Extend Card Processing Services to Costco Business Members". ^ "Snapshots of Optical's 10 Largest U.S. Retail Players". Vision Monday. May 16, 2016. Retrieved June 26, 2016. ^ Allan, Patrick (June 17, 2014). "The Best Things You Can Do at Costco Without a Membership". The Best Things You Can Do at Costco Without a Membership. Lifehacker. Retrieved December 6, 2014. ^ Conover, Raechel (August 25, 2015). "How Non-Members Can Shop at Costco". msn.com. Retrieved June 28, 2016. ^ "Costco Travel". Costco Travel. Retrieved February 20, 2012. ^ "10 Things You Didn't Know About Costco Food Court". DailyMeal.com. ^ "Things You Didn't Know About Costco Food Court". Fox News. November 30, 2015. ^ Gaudette, Karen (May 24, 2006). "Costco is THE place for inexpensive dining". The Seattle Times. Archived from the original on February 19, 2011. ^ Wight, David & Bjorkman, Steve (Illustrator) (March 2009). "Order in the Court (Costco food courts consistently deliver the value, quality, and efficiency members appreciate)". Costco Connection. pp. 20–24. CS1 maint: Multiple names: authors list (link) History of Costco Food Courts. ^ a b Romano, Benjamin (July 5, 2018). "Costco changes up food court menu, but the $1.50 hot dog deal remains". The Seattle Times. Retrieved August 12, 2018. ^ Kuban, Adam (January 7, 2011). "Costco, a Pizza Chain Hiding in Plain Sight". ^ "Costco Food Court's New Beef Bake". October 2009. ^ "Costco Food Court Nutrition Data". Google. Retrieved February 20, 2012. ^ Lopez, Fana (April 2018). "¡Amantes de Costco y los taquitos! Ya existe la pizza de pastor y el mundo no volverá a ser igual". Buzzfeed (in Spanish). ^ "Costco Japan's bulgogi bake is a melting pot of deliciousness". February 13, 2014. ^ Peterson, Lucas. "The Official Costco Food Court Power Rankings". Lucky Peach. Archived from the original on April 10, 2017. Retrieved April 10, 2017. ^ "Costco's $1.50 hot dog-soda combo to get big change". Seattle Post-Intelligencer. Retrieved February 7, 2013. ^ No, Michelle (April 2018). "Costco's Food Court Is Testing Cheeseburgers And They Look Glorious". Buzzfeed. ^ "PhotoChannel Signs Agreement with Costco Canada". ^ "CVS Probes Card Breach at Online Photo Unit". Krebs On Security. July 2015. ^ "CVS Photo Hack". CNN Money. July 17, 2015. ^ "Costco Delays online Photo Services' Return, Citing Ongoing Security Concerns". GeekWire. 2015. ^ "Costco Wholesale Corporation Launches B2B E-commerce Site". ^ "Site Profile for costco.com (rank #136)". Compete. Retrieved November 27, 2009. ^ "Costco Grocery Delivery - Instacart". Retrieved April 10, 2017. ^ Burrows, Dan. "Costco Expands Online Grocery Delivery With Shipt". Kiplinger. Retrieved April 10, 2017. ^ "You Can Now Order Same-Day Delivery From Costco". Fortune. Retrieved 2017-10-06. ^ "Costco Workers Stand Together". Teamster.org. Retrieved February 20, 2012. ^ "Unionize Costco". Archived from the original on January 16, 2013. Retrieved August 15, 2012. ^ Greenhouse, Steven (July 17, 2005). "How Costco Became the Anti-Wal-Mart". The New York Times. ^ "Costco Product Demonstrations". Warehouse Demo Services (WDS). ^ "About CDS". Archived from the original on July 2, 2015. Retrieved July 1, 2015. ^ "Professional Warehouse Demonstrations". Pwdemonstrations.com. Archived from the original on March 10, 2012. Retrieved February 20, 2012. ^ Edmonds, Robert (February 15, 2012). "We Are Family?". North Bay Bohemian. Retrieved February 20, 2012. ^ Hodal, Kate; Chris Kelly; Felicity Lawrence (June 10, 2014). "Revealed: Asian slave labour producing prawns for supermarkets in US, UK". The Guardian. Retrieved June 11, 2014. Charoen Pokphand (CP) Foods, buys fishmeal, which it feeds to its farmed prawns, from some suppliers that own, operate or buy from fishing boats manned with slaves. ... CP Foods admits that slave labour is part of its supply chain. ^ "Shrimp Sold at Walmart, Costco Tied to Slave Labor". CBS Money Watch. June 11, 2014. ^ "Walmart, Tesco and Costco among retailers responding to revelations of slavery in prawn supply chains". The Guardian. June 10, 2014. ^ "Disclosure Regarding Human Trafficking and Anti-Slavery". Costco. June 2014. ^ "Costco Melbourne Docklands Prices List – Comparison *Updated*". BuckScoop. Archived from the original on August 21, 2009. Retrieved August 30, 2009. ^ "Costco to Open 28 Locations in 2013". Produce Industry News. Retrieved October 23, 2013. ^ "Costco Wholesale Historical Highlights" (PDF). Costco Wholesale. December 15, 2016. Retrieved October 22, 2017. ^ Desjardins, Doug (December 19, 2005). "At 40% larger, new Costco prototype redefines big". DSN Retailing Today. Retrieved May 27, 2013. ^ "Salt Lake Costco becomes largest in the world". Deseret News. ^ "Retiring CEO of Costco takes a look back on his legacy". The Seattle Times. ^ "First Costco Business Center in Las Vegas opens". Las Vegas Sun. February 20, 2009. ^ "Costco Business Center Locations". Costco Business Center. ^ "Costco Business Centre". Costco Wholesale Canada Ltd. Retrieved March 1, 2017. ^ Devenyns, Jessi (2018-09-24). "Costco's in-house poultry production signals a new supply chain approach". Retrieved 2018-09-25. ^ Shaffer, Erica (2018-09-21). "Costco poultry complex to have retail ripple effect". MEAT+POULTRY. Retrieved 2018-09-25. ^ "U.S. Meat and Poultry Production & Consumption: An Overview" (PDF). North American Meat Institute. September 2016. Retrieved 2018-09-25. ^ "Location of first Costco and year opened". ^ Desjardins, Doug (January 6, 2003). "Costco Home poised to revolutionize high-end furniture". DSN Retailing Today. Retrieved November 27, 2009. ^ "Costco Home furniture store in Tempe to close". The Arizona Republic. April 2, 2009. Retrieved May 17, 2015. ^ "Crated Cruelty: The Hidden Price of Veal". Mercy For Animals. Archived from the original on January 16, 2013. Retrieved September 27, 2012. ^ Allison, Melissa. "Costco bans treatment of veal calves that industry calls typical". The Seattle Times. Retrieved September 27, 2012. ^ Runkle, Nathan. "Progress for Ohio's Farmed Animals". Mercy For Animals. Retrieved September 27, 2012. ^ "Walmart Cruelty: The Hidden Cost of Walmart's Pork". Mercy For Animals. Retrieved September 4, 2012. ^ Runkle, Nathan. "Victory! Costco and Kmart Commit to Ditching Gestation Crates Following MFA Investigation". Mercy For Animals. Archived from the original on August 22, 2012. Retrieved September 4, 2012. ^ Runkle, Nathan. "Safeway Pledges to Eliminate Cruel Gestation Crates from Supply Chain". Mercy For Animals. Archived from the original on October 13, 2012. Retrieved September 2, 2012. ^ Worl, Justin. "An Undercover Investigation Alleges Major Mistreatment of Egg-Laying Hens". Time. Retrieved October 21, 2015. ^ "Costco: It's Time to Go Cage-Free - The Humane Society of the United States". action.humanesociety.org. Retrieved October 21, 2015. ^ "Brad Pitt has a major grievance with Costco". Business Insider. Retrieved October 21, 2015. ^ "Take A Stand Against Animal Cruelty". thehumaneleague.com. Archived from the original on October 6, 2015. Retrieved October 21, 2015. ^ Shanker, Deena. "After months of pressure, Costco commits to a cage-free egg supply". Quartz. Retrieved February 26, 2016. ^ a b Strom, Stephanie. "How 'Cage-Free' Hens Live, in Animal Advocates' Video". The New York Times. Retrieved January 9, 2017. ^ Moyer, Justin. "'Her head has been torn off': Activists' film alleges abuse at Costco-linked cage-free egg farm". The Washington Post. Retrieved January 9, 2017. ^ Hsiung, Wayne. "'They're Being Eaten Alive!' What I Saw In A Cage-Free Egg Farm". The Huffington Post. Retrieved January 9, 2017. ^ "Costco ordered to pay $19.4M for misleading 'Tiffany' jewelry". New York Post. August 14, 2017. Retrieved August 28, 2017. ^ McCoy, Kevin (August 15, 2017). "Judge: Costco must pay Tiffany $19.4 million for advertising knock-off rings". USA Today. Retrieved October 22, 2017. Wikimedia Commons has media related to Costco. This page was last edited on 17 April 2019, at 05:13 (UTC).